By now, I’ve talked about my oak leaf wine a few times. It’s been fermenting for close to 9 months, and it is still horribly sweet. OK, it’s not really horrible, but it’s way too sweet. I’m guess in the Montrachet yeast is pretty much finished. After talking to some other brewers, I came up with a plan to try to kick the fermentation into high gear again. Pitching dry yeast right into the carboy isn’t going to do much, since there isn’t enough oxygen to allow the yeast to reproduce and the alcohol will kill the yeast before it can get going. In order to overcome those challenges, you need the yeast to be super active and chowing down when it goes into that high-sugar/high-alcohol environment. I sanitized this half-gallon jar,added a cup of water and the champagne yeast to start the re-hydration process. After that, I got the starter solution going. I mixed 13 ounces of sugar with 3 pints of water and brought it up to a boil. Once it boiled for a couple minutes, I took it off the heat and added a teaspoon of yeast nutrient. I put a cover on the pan and cooled it down in a cold water bath. 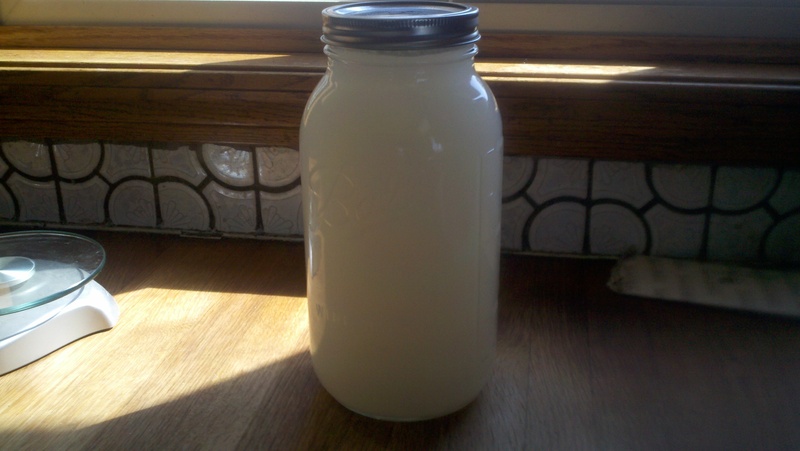 Once it got down into the mid-80s Fahrenheit, I added the liquid to the jar and shook it up. Once it get going (tonight or tomorrow morning), I’m going to pitch it into the the carboy of wine and hope for the best. Stay tuned, and I’ll let you know what happens in a few months.